The Suffolk Escape01473 652149work Self-cateringOn our family farm in Hintlesham, we offer luxury log cabins with hot tubs and a unique barn set in an idyllic, rural retreat in the heart of the Suffolk countryside. We offer peaceful, self-catering holidays for those wishing to escape from the hustle and bustle of daily life, where you can do as much, or as little, as you choose. Guests tell us time and time again it’s the ideal place to stop, relax and unwind. All accommodation has been built to the highest standard with exceptional attention to detail. Our luxurious, lake-side log cabins have two bedrooms, open plan living space, wood burning stove, deck set over the lake and secluded hot tubs. The adult-only cabins appeal to those looking for a peaceful break, suiting groups of friends and couples looking for a romantic escape. Our award-winning Sheepyard Barn provides groups of family and friends, including children and dogs, an idyllic setting for social gatherings that create memories which last forever. Sleeping up to 12, it offers a large, open plan living space with floor to ceiling sliding glass walls to give stunning views. It has an indoor swimming pool, home cinema system and a 4-cabin adult bunk room. Outside, guests can indulge in the hot tub, an outdoor lounge or make pizzas in the wood fired pizza oven. For the children – or playful adults – there is a sunken trampoline and separate games room. It attracts multi-generational families, groups of friends, birthday celebrations, boot camps and retreat breaks. 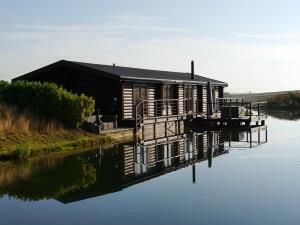 On our family farm in Hintlesham, we offer luxury log cabins with hot tubs and a unique barn set in an idyllic, rural retreat in the heart of the Suffolk countryside. The log cabins and Sheepyard Barn have their own private hot tubs. The Sheepyard Barn has its own indoor swimming pool, complete with a Fastlane counter-current swim machine. We offer bicycle hire to log cabin guests to explore the many cycle routes from the farm. There are many local footpaths from the farm, around the farm and nearby. There are local leisure facilities in nearby market town Hadleigh, Sudbury and Ipswich. We offer farm safari’s in the summer months – a trip around the farmland with owner, Andrew, and the opportunity to meet the sheep and lambs We also offer wood fired pizza oven making packages at the barn. Each property has its own bbq, outdoor sofas, outdoor dining facilities and the cabins have chimineas in the warmer months.